The Rio Roosevelt Lodge is located in the heart of the Amazon, surrounded by virgin forests at the meeting of the Rivers Roosevelt and Madeirinha the foot of the waterfall Sta. Rita. Are beautiful landscapes for you to enjoy unforgettable moments, both for sport fishing as the observation of birds, animals and butterflies, walking nature trails, knowing streams and can stay overnight in comfort at the outposts. The Rio Roosevelt Lodge was designed in complete harmony with nature, offering the viewer the greatest number of bird species across Latin America, with over 500 species of birds and about 12 species of primates. We spent nearly a century the river remains completely unexplored, with great abundance of fish, notably: Tucunaré, Jatuarana, Cachara, caparari, Pirarara, Jau, Corvina, Barracuda, Pirapitinga, Cachorra, Piraíba, Jundiá, among others. Tower for bird watching and animal 30 meters high at the level of the treetops, divided into 7 platforms for observation at all levels. 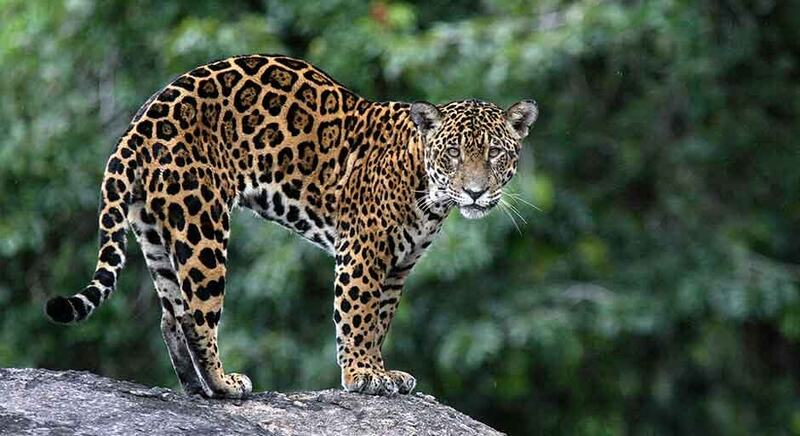 We have 13 trails in strategic places with large varieties of species in a virgin region of Brazil. The Rio Roosevelt Lodge has 06 cottages with 55m², air-conditioned, facing the beach and waterfall making your stay unforgettable. Gratuiras offer accommodations for private aircraft commanders. 06mts use boats equipped with 25 hp motor, swivel chairs, coolers with ice and drinks to make your day as pleasant as possible, noting the untouchable esuberancia across the region. Who arrives at the Rio Roosevelt Lodge will be amazed at the place. Of the chalets (6 cottages) have all the necessary comfort, integrating the tourist / fisherman to the Amazon forest environment and is equipped with air conditioning, refrigerator, bathroom with hot shower. We provide laundry service and four ice machines with capacity of 400 kg / day. The inn has a restaurant overlooking the natural beach and waterfall where you can take a refreshing and safe bathing in the waters of the Rio Roosevelt. Rates include breakfast, lunch, happy hour and dinner with beer, soft drinks, juices and mineral water included. The nature of the Roosevelt River further collaborates with the beauty of the inn. Thousands of butterflies can be observed by all the places that you walk or navigating. If the river had the name “River of Butterflies”, it would also be quite appropriate. In addition to several wild animals like a capybara and mutum, the scenario consists of several rare species of trees and plants. 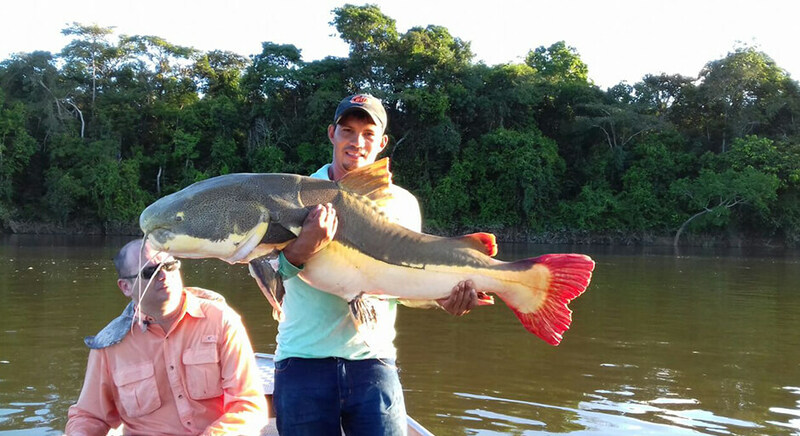 We promote the sport fishing of our guests with guides specialized in providing a great service, besides knowing very well the region and places suitable for fishing. For nature lovers, our regions have a large amount of birds and animals that can be observed and photographed during the tours. 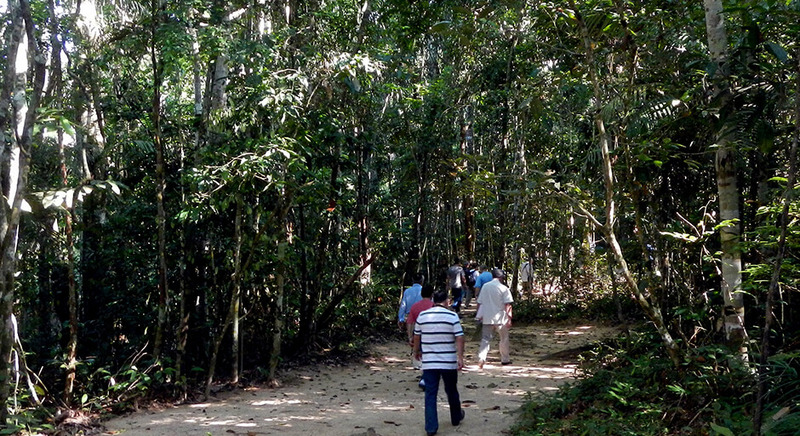 Our lodge has several tracks for you breaking the Amazon rainforest.